ESY_ASTRAL_ART (Eseniya Lanskaya) was born on August 22, 1989, in Kuressaare, Estonia. Her parents used to move frequently from place to place due to father's career in SU military services. As a child, Eseniya's parents encouraged her to think differently and search for answers in an independent way. For the first time she had a crush on art when she was 10 years old. Her grandma recognized the child's talents and, being motivated to give to her grandchild all the art education she could, created a special "Art Box", which contained reproductions of local & international artists, who worked during various historical periods of time. The pursuit of aestheticism included classical instrumental and opera compositions. "Each morning and afternoon I would open the box, turn on the music, and start looking through numerous artwork reproductions, copying drawings of the great masters, like Leonardo, Raffaele, Michelangelo and Botticelli." In 1998 Eseniya started studying at one of Moscow's local art school, successively completing the whole 5 years course. In 2007 Eseniya graduated from school with perfect marks in the following subjects: drawing, draftsmanship, literature, history and foreign languages. At that time Russia was still healing the Soviet Union dissolution wounds and the times were unstable. Internet wasn't as developed as nowadays and the country's art market demonstrated stagnation. Eseniya had to go and study foreign languages at Moscow State University of Linguistics. "We have a saying, that from one exam session to the other students live happily and peacefully. I never knew what this phrase was about, due to active tough studies." Majority of students were graduates of special linguistic schools, what increased the average level of the students's knowledge. "I had to show, that I can be at the same level with them, thus I started studying during late nights." In the end this type of stressful life-style brought her to the edge. One night Eseniya's mother saw her daughter dreaming with eyes and mouth opened, she was so bare-boned and exhausted, that it seemed, for an instance, that the girl was dead. "My mother gave me two lives." With the family's support Eseniya managed to cope with anorexia nervosa. "Today I am one of the 10% of the worldwide population, who won the sly disease, but without family and their support it wouldn't be possible." In 2012 Eseniya arrives in New Zealand to study the applied hospitality at Pacific International Hotel Management School. She continues drawing, painting, reading about artists and get inspired by such artists as: Salvador Dali, Frida Khalo, Alfons Mucha, J.W. Waterhouse, Istvan Sandorfi and Chuck Close. They remain the main influencers for the artist. "Foreign language skills improvement through real practice opened to me the sea of opportunities to discover new horizons of thinking and enrich the visual potential. It is a portal into the worldwide culture, habitudes, traditions and various points of view. It is one of the greatest gifts a contemporary person may wish for, it is the opportunity to become the citizen of the world and go beyond the geographical belongings." 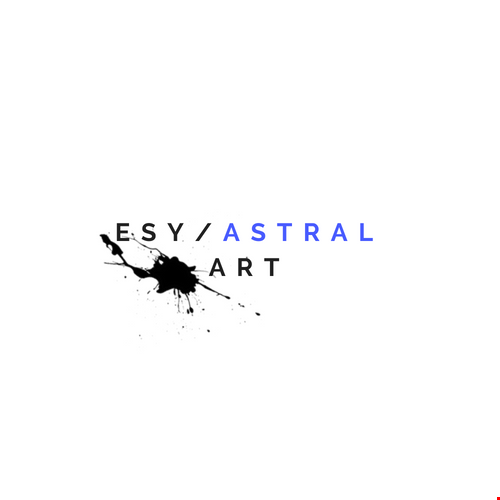 Properly in New Zealand Eseniya discovered astral realities, the experience which changed her life for ever, details will be released in the next article. In October 2017 Eseniya moved to Italy, where she lives with her partner. Life experiences, worldwide travelling and the unquenchable interest in knowledge took an integral part in the artist's style development. "I decided to mirror contemporary social and personal issues through the astral lens and combine them with personal artistic vision." While the artist continues following her passion for drawing, she also incorporated acrylic and ultra-violet painting in order to communicate with viewers throughout different levels of consciousness. One of the recent art projects "Invisible Reality" builds it's communication on the "invisible body language", which is recognized by subconscious.This gives opportunity to deliver the artistic vision and reach synergy with all human personalities. "I don't have social prejudices box on my head, neither do my vision, thoughts and conscious belong to a geographical territory", - says the artist.